With the weather getting warmer, it’s time to get out and play some sports! It’s great to start enjoying sports activities again, however did you know that sports are responsible for the majority of mouth and teeth injuries and accidents? You take precautions to wear the right type of protective gear for your body when you’re playing sports, and the same thing should go for your mouth. Wearing a mouth guard in Norwood is beneficial for protecting your teeth and your oral health. A mouth guard is a plastic appliance that is designed to fit over your teeth and helps protect your mouth from injury during sports. It is recommended for sports such as football, hockey, soccer, rugby, basketball, and baseball. There are however, some other sports in which it may also be beneficial to wear a mouth guard such as gymnastics, skiing, martial arts, and skateboarding. 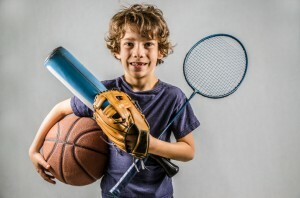 You may not have thought of these sports as requiring protective gear such as a mouth guard, but when it comes to protecting your teeth it’s better to err on the side of caution. It’s best to discuss your needs with your dental provider in order to determine if yours is a sport that may require additional protection. Once you’ve determined that you need one, it’s time to pick out a mouth guard. It’s important to understand that all mouth guards are not created equal. There are different types of mouth guards available at your local sporting goods store such as a generic ready-made mouth guard, or a bite and form mouth guard. A ready-made mouth guard is just as it sounds; it’s sized small, medium, or large, but not a custom fit, so it doesn’t offer optimal protection. A bite and form mouth guard is made of a pliable acrylic material that you bite into to mold around your teeth. While this does fit better than a ready-made mouth guard, it can feel bulky making it hard to talk and breathe while it’s in. Your dentist can make you a custom fit mouth guard that is fabricated using impressions of your teeth. Your dentist will make sure that your mouth guard fits properly and can even make adjustments for you if necessary. This type of mouth guard offers optimal protection due to a snug fit, while allowing you to talk and breath easier during your activity. At Central Dental Associates, our doctors have been customizing mouth guards for patients for a number of years. Our team will discuss your needs with you and help you determine which type of guard is best, so you can focus on the game. Helping you maintain optimum oral health is always our goal, and this includes protecting your teeth from damage or injury. Contact our office today to learn more about our options for mouth protection.